Our article on the microbiome of Costa Rican beetles has been published today in @thePeerJ https://t.co/sYZ6pDMLW6 #Biodiversity #Ecology #Entomology #Microbiology. Check it out! Note that a Preprint of this article also exists, first published March 14, 2018. © 2018 Blankenchip et al. The beetle genus Cephaloleia has evolved in association with tropical ginger plants and for many species their specific host plant associations are known. Here we show that the core microbiome of six closely related Costa Rican Cephaloleia species comprises only eight bacterial groups, including members of the Acinetobacter, Enterobacteriacea, Pseudomonas, Lactococcus, and Comamonas. The Acinetobacter and Enterobacteriacea together accounted for 35% of the total average 16S rRNA ribotypes recovered from all specimens. Further, microbiome diversity and community structure was significantly linked to beetle diet breadth, between those foraging on less than two plant types (specialists) versus over nine plant types (generalists). Moraxellaceae, Enterobacteriaceae, and Pseudomonadaceae were highly prevalent in specialist species, and also present in eggs, while Rickettsiaceae associated exclusively with generalist beetles. Bacteria isolated from Cephaloleia digestive systems had distinct capabilities and suggested a possible beneficial role in both digestion of plant-based compounds, including xylose, mannitol, and pectin, and possible detoxification, via lipases. Cephaloleia species are currently expanding their diets to include exotic invasive plants, yet it is unknown whether their microbial community plays a role in this transition. In this study, colonization of invasive plants was correlated with a dysbiosis of the microbiome, suggesting a possible relationship between gut bacteria and niche adaptation. Mutually beneficial symbioses are the rule, rather than the exception, and the discovery and elucidation of the role of symbiotic microorganisms to animal life has emerged as an important area of research. Among insects, persistent bacterial partnerships are well documented and believed to play a critical role in host adaptation to specific niches. Microbiological studies on aphids, stinkbugs, psyllids, white flies, mealybugs, and leaf-hoppers have provided insights into the physiological, ecological, and evolutionary history of bacterial symbioses with insects that primarily consume plant sap (reviewed in Moran & Telang, 1998; Wernegreen, 2002; Douglas, 2009; Bistolas et al., 2014). It is widely accepted that symbioses allow insect herbivores to exploit plants more effectively, however little specific evidence has been reported for chewing phytophagous insects, particularly in the understudied tropical rainforests (Genta et al., 2006; Kuriwada et al., 2010; Hansen & Moran, 2014). With more than 200 described species, the neotropical beetle genus Cephaloleia (Chevrolat) has evolved in specific association with gingers in the order Zingiberales (Staines, 1996; Wilf et al., 2000; McKenna & Farrell, 2006; García-Robledo & Staines, 2008). For ∼50 MY, Cephaloleia beetles have specialized on the immature rolled leaves of these gingers, which they use for nutrition, development, reproduction, and as shelter (McKenna & Farrell, 2005). Unlike most tropical insects, host plant associations are known for most of the sympatric species of Cephaloleia that inhabit the lowland rainforest in and around La Selva Biological Station, Costa Rica (Staines, 2011; García-Robledo & Staines, 2014). As a group, they display variability in diet breadth, ranging from hypergeneralist species, such as Cephaloleia belti (Baly) which feeds on 15+ plants from three Zingiberales families, to specialist species, such as C. placida (Baly) which is only found on a single plant species (McKenna & Farrell, 2005; García-Robledo et al., 2013). Studies exploring the link between gut bacterial community and diet in non-sap sucking insects have produced conflicting results (Colman, Toolson & Takacs-Vesbach, 2012; Jones, Sanchez & Fierer, 2013; Rahman et al., 2015), and very few have examined closely related insects with both generalist and specialist feeding strategies. Fierer and colleagues recommended that in order to resolve the effects of diet on the microbiome, future studies should focus on a single group of insects with varied diets (Jones, Sanchez & Fierer, 2013). Thus, the contrasting dietary breadths of Cephaloleia beetles make them an ideal natural group by which to examine the, perhaps reciprocal, role of the microbiome on niche adaptation. Additionally, in the last two decades, at least four Zingiberales from South America have invaded the tropical rainforest of La Selva, including the pink velvet banana and white ginger lily (García-Robledo & Horvitz, 2011). Interestingly, at least eight Cephaloleia beetle species, including several specialists, are currently expanding their diets to exploit these novel Zingiberales (García-Robledo & Horvitz, 2011). Understanding the presence, diversity, and pervasiveness of bacteria associated with insects, especially in relation to diet breadth, is a necessary and integral component of insect nutritional ecology (Douglas, 2013). In this paper, we sought to characterize the diversity of bacteria, via 16S rRNA sequencing and bacterial cultivation, associated with adults (and a small number of eggs) of six species of Cephaloleia beetles, including two generalist and four specialist species. Initially we hypothesized that generalist species would have a more diverse microbiome, as an adaptation to a wide range of plant types or as a consequence of increased encounters with diverse bacteria associated with plant tissues (Hansen & Moran, 2014; Engel & Moran, 2013). Major beetle bacterial groups were cultured to determine their metabolic capabilities and whether they might aid in plant digestion or detoxification of plant compounds by the host insect. Three Cephaloleia species were collected from invasive white ginger and pink banana, including the generalist C. belti and specialists C. placida and C. dilaticollis (Baly). Comparisons between beetles feeding on native versus invasive plants was expected to reveal specific bacterial groups related to colonization of exotic plants and provide a better understanding of the role of the microbiome in adaptation. Adult beetles (n = 38; Fig. 1) were collected in 2014–2016 at La Selva Biological Station, a 1,500 ha ecological reserve in a lowland tropical rainforest site in northern Costa Rica (10°26′N, 83°59′W; current Costa Rican Ministry of the Environment and Energy permit #R-026-2015-OT-CONAGEBIO). Adults were located by searching for rolled Zingiberales leaves that were then unrolled and beetles collected with forceps. Beetles with excised exoskeletons were preserved in 70% ethanol, at 4 °C, for later molecular analysis. Cephaloleia eggs (n = 5) were collected adhered to plastic after mating pairs were kept for a brief time in captivity in bags. Usually the adults laid eggs on the plastic, which was remote from where they spent most of their time (in a rolled leaf near the bottom of the bag, or in the zipper seals of the bag). The piece of plastic with attached egg was then surface sterilized and kept in ethanol until analysis. Any bacterial presence in the eggs was therefore attributed to vertical transmission by adults, and not due to adult contamination of the eggs. For bacterial cultivation, the digestive systems of the beetles were dissected in sterile 1× phosphate buffered saline (PBS) and homogenized using a ground glass mortar and pestle. The resulting homogenate was spread onto Trypticase Soy Agar (TSA) and incubated at ambient temperatures. Resulting bacterial colonies were selected and stored at −80 °C in 30% glycerol (in 1× PBS). All samples were transported back to the US for further processing. Figure 1: Costa Rican Cephaloleia species in this study. Costa Rican Cephaloleia species in this study include (A) C. dilaticollis, (B) C. placida, (C) C. reventazonica, (D) C. dorsalis, (E) C. fenestrata, and (F) C. belti. (G) A mating pair of C. erichsonii on a young rolled leaf of Calathea lutea. All life stages and most behavior, including mating, take place on plants within the order Zingiberales. Scale bars = 1 mm for all images, except far right where the scale bar is 1 cm. Photo credits: S. Goffredi. Adult beetles were identified based on diagnostic morphology and host plant (the latter mainly for specialist beetles that feed on only a single plant type; McKenna & Farrell, 2005; García-Robledo et al., 2013). In one cased we employed DNA analysis for identification; C. dilaticollis currently encompasses two cryptic species, one of which is a specialist and the other a generalist. Total genomic DNA was extracted using the Qiagen DNeasy Kit (Qiagen, Valencia, CA, USA) according to the manufacturer’s instructions. The cytochrome c oxidase I (COI) gene was amplified via the polymerase chain reaction (PCR) using the insect COI primers 1718F (5′-GGAGGATTTGGAAATTGATTAGTTCC-3′) and 3661R (5′-CCACAAATTTCTGAACATTGACCA-3′) according to McKenna & Farrell (2005). Successful PCR reactions, determined via electrophoresis, were cleaned using MultiScreen HTS plates (Millipore Corporation, Bedford, MA, USA) and sequenced via Laragen, Inc. (Los Angeles, CA, USA). Beetle species identification was confirmed based on COI sequences, upon consultation with Dr. Carlos García-Robledo (University of Connecticut). Adult Cephaloleia beetles from six species found on native plants (n = 29) and three species found on invasive plants (n = 9) were examined for microbiome composition via 16S rRNA gene barcode sequencing (Table 1). As described above, total genomic DNA was extracted using the Qiagen DNeasy Kit (Qiagen, Valencia, CA, USA) according the manufacturer’s instructions. All extractions were from individual beetles, with the exception of C. dorsalis (Baly) which due to its small size, two to three individuals were pooled to achieve positive PCR results. PCR amplification of the bacterial 16S rRNA gene was performed using the specific primers, 515F (5′-GTGCCAG-CMGCCGCGGTAA-3′) and 806R (5′-GGACTACHVGGGTWTCTAAT-3′; Caporaso et al., 2011). The thermal cycling profile used was as follows: an initial denaturation at 94 °C, then 45 s at 94 °C, 1 min at 50 °C, and 90 s at 72 °C, for 29 cycles, followed by 10 min at 72 °C. Successful PCR amplifications, assessed via electrophoresis, were pooled, in duplicate, and barcodes were added according to the Earth Microbiome Project (EMP; Caporaso et al., 2011); 5 μl of the amplicon product from PCR#1 was used as template in a five cycle, 25 μl reconditioning reaction with the same EMP-recommended conditions and the full EMP primers (515f_barcode: AATGATACGGCGAC-CACCGAGATC-TACACTATGGTAATTGTGTGCCAGCMGCCGCGGTAA; 806r_barcode: CAAGCAGAA-GACGGCATACGAGAT-X-AGTCAGTCAGCCGGACTACHVGGGTWTCTAAT), where X indicates a unique 12 bp barcode. Adding the barcode indices at the second step minimizes PCR bias that would result from employing long primers over many cycles (Berry et al., 2011). Further, the use of the “reconditioning” PCR for barcoding, as well as the pooling of duplicate amplifications ahead of barcoding, was an attempt to minimize PCR errors and bias, respectively (Kennedy et al., 2014). Samples were mixed together in equimolar amounts and purified in bulk through a Qiagen PCR Purification kit. At all PCR steps, amplification success and purity was checked by gel electrophoresis. Paired-end sequences (2x 250 bp) were generated from barcoded amplicon products at Laragen, Inc., on an Illumina MiSeq platform. At Laragen, the raw data was passed through a filter which demultiplexed the library into individual samples and removed any sequences which had >1 bp mismatch on the 12 bp barcode sequence, and assigned quality scores to each basepair call on every sequence. At the same time, adapter, barcode, and primer sequences were removed. Beetle specimens analyzed in this study. Specimens analyzed in this study, showing the # of 16S rRNA sequences generated from barcoding, along with corresponding measures of diversity. a H. = Heliconia, He. = Hedychium, M. = Musa, R. = Renealmia, Co. = Costas. b Define “normalized”—without mitochondria and chloroplasts; with Wolbachia. c Diversity values without Wolbachia. Sequence processing was performed in QIIME 1.8.0 (Quantitative Insights Into Microbial Ecology; Caporaso et al., 2010). Sequences were clustered at 99% similarity and a representative sequence from each cluster was assigned a taxonomic identification using parameter -m in QIIME and the Silva115 database. Via barcode amplicon sequencing, 13829–68837 sequences were recovered from each specimen (Table 1; Table S1). To avoid artifacts of sequencing depth, the number of sequence reads was standardized to 13829 sequences per specimen, based on the lowest sequence number for specimen “Cp_inv1” (C. placida on invasive white ginger; Table 1). The dataset was further cut off at 1% (i.e., the number of sequence hits for a single bacterial OTU across all 38 specimens must have been greater than 138 to be included). After this cutoff, sequences ranged from 9899 to 13324 per specimen (Table 1). Wolbachia was observed in 18 specimens, among three species (range of 0.1–56.6% for all sequences; C. belti avg 22% ± 18%, C. reventazonica avg 41% ± 17%, C. fenestrata avg 10% ± 13%,), but was removed from subsequent analysis based on its known prevalence in insects as a reproductive pathogen (Table S2). Sequences corresponding to chloroplasts and mitochondria were also removed from the data set. NMDS, ANOSIM, and SIMPER analyses were completed in Primer-E after square-root transforming the dataset and calculating Bray–Curtis similarities (Clarke & Warwick, 2001). An ANOSIM R value close to “1.0” suggests dissimilarity between groups. Close environmental and cultured relatives were chosen using top hits based on BLAST (www.ncbi.nlm.nih.gov). RStudio was used to perform ANOVA calculations using a script available at https://sites.oxy.edu/sgoffredi/Symbiosis_Lab/LabScripts.html. Cephaloleia belti individuals (n = 45) were photographed and sized (length and width at pronotum) using imageJ (Schneider, Rasband & Eliceiri, 2012). The eight largest and eight smallest beetles were dissected for molecular analysis according to the methods described above. Total DNA of the body of the beetles was extracted using the Qiagen DNeasy Kit (Qiagen, Valencia, CA, USA) according the manufacturer’s instructions. For these 16 beetles, a diagnostic PCR using two different sets of pathogen-specific PCR primers was performed specifically for the bacterial genera Rickettsia (Rsp-F 5′-CGCAACCCTCATTCTTATTTGC-3′, Rsp-R 5′-CCTCTGTAAACACCAT-TGTAGCA-3′; Giulieri et al., 2012) and Spiroplasma (Spiro_16SF 5′-GGTCTTCGGATTGTAAAGGTCTG-3′, Spiro_16SR 5′-GGTGTGTACAAGACCCGAGAA-3′; Haselkorn, Markow & Moran, 2009) with the following thermal protocol: an initial 5 min denaturation at 94 °C, then 1 min at 94 °C, 1 min at 56 °C, and 1 min at 72 °C, for 29 cycles, and a final 5 min extension at 72 °C. Successful PCR amplification was determined via electrophoresis and confirmed to be Rickettsia or Spiroplasma via direct Sanger sequencing (Laragen, Inc., Los Angeles, CA, USA). Initial bacterial suspensions in 30% glycerol stocks were re-grown on TSA plates at 30 °C. Growth was checked for morphological purity before being suspended in 40 μl of alkaline PEG (60 g of PEG 200 with 0.93 ml of 2 M KOH and 39 ml of water). This suspension was then heated to 96 °C for 20 min in order to lyse the bacterial cells and liberate the DNA. The 16S rRNA gene was then amplified directly using the general PCR primers 27F and 1492R (Lane, 1991) and the following thermal protocol: an initial 5 min denaturation at 94 °C, followed by 94 °C for 45 s, 54 °C for 1 min, and 72 °C for 90 s, for 29 cycles, and a final 72 °C extension for 10 min. Successful amplifications were checked via electrophoresis, cleaned using MultiScreen HTS plates (Millipore Corporation, Bedford, MA, USA), and sequenced at Laragen, Inc. Sequences were compared with the NCBI BLAST database to determine bacterial identity. Bacteria were propagated on TSA plates to ensure proper activity prior to metabolic testing. The ability to digest lactose/glucose, xylose, mannitol, and pectin was determined using phenol red agar (HiMedia, with 10% of each substrate). Protein digestion was determined using Litmus Milk tubes purchased from Carolina Biological Supply Company (Burlington, NC, USA). The ability to breakdown lipids was tested using an APIZYM analysis (bioMerieux, Inc., Durham, NC, USA), according to the manufacturer’s instructions. The raw barcode sequence data are available from the Dryad Digital Repository: http://dx.doi.org/10.5061/dryad.5fj6t. Raw sequences were aligned and quality control for unidentified base pairs and chimeras was performed according to the specifics noted at https://sites.oxy.edu/sgoffredi/Symbiosis_Lab/LabScripts.html. The QIIME processed data are also available from the Dryad Digital Repository: http://dx.doi.org/10.5061/dryad.5fj6t. 16S rRNA sequences for bacterial isolates are available from GenBank under accession numbers MF776885–MF776899. Using barcode 16S rRNA analysis, the microbiome of adults of six species of Cephaloleia, foraging on native plant diets, was characterized taxonomically (Table 1). Collectively, 168 bacterial OTU’s (“operational taxonomic unit;” defined as 99% sequence similarity) were recovered from all adult specimens examined (n = 29), while individual beetles generally associated with 47–152 OTUs (100 ± 31). Greater than 60% of Cephaloleia specimens contained a core group of eight bacterial OTUs, including three members of the Acinetobacter, two undefined Enterobacteriacea, Pseudomonas, Lactococcus, and a Comamonas (Figs. 2 and 3; Table S1). These eight bacterial OTUs comprised the majority of 16S rRNA sequences recovered from each Cephaloleia individual (up to 88%). Figure 2: Relative abundance of bacterial families. Figure 3: Prevalence versus relative abundance of bacterial OTUs. Prevalence versus relative abundance of bacterial OTUs associated with six Cephaloleia species (n = 29 specimens, collected on native diets). 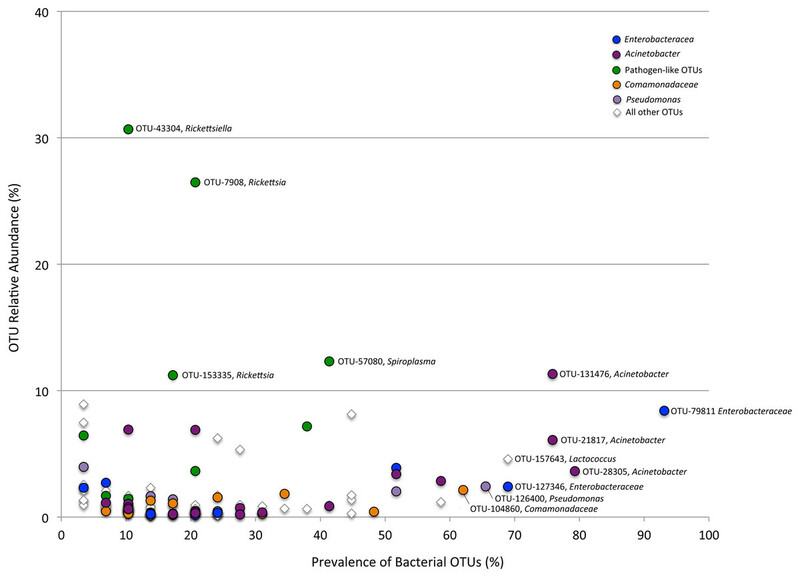 Certain dominant OTU groups are indicated separately by color (e.g., Acinetobacter), with 12 shown by OTU# based on ≥60% prevalence or ≥10% relative abundance (including four noted in green that matched bacterial groups typically thought of as pathogens). A single bacterial family, Moraxellaceae, dominated the microbiomes of all 29 specimens feeding on native plants, combined (representing 24% of the total recovered sequences). The genus Acinetobacter, in particular, comprised the vast majority of the Moraxellaceae sequences and accounted for 23% of the 16S rRNA sequences recovered overall. Of the 19 different Acinetobacter OTUs, three were responsible for 60% of the total Acinetobacter diversity and were each present in >75% of beetles (OTUs-131476, 21817, and 28305; Fig. 3, shown in purple; Table S1), suggesting them to be members of the core Cephaloleia microbiome. Acinetobacter OTU131476 was found in 22 of 29 specimens, and was 11% abundant (on average, for all sequences recovered in each of 29 beetles found on native plants; Fig. 3). This OTU was 98% similar to bacteria associated with both leaf cutter ants and fig wasps (GenBank accession #’s LN564930, HQ639556). Acinetobacter OTU21817 was also found in 22 of 29 specimens, represented 6% average abundance (Fig. 3), and was 100% similar to bacteria found in the midgut of a leafworm moth (GenBank accession # KU841476). Acinetobacter OTU28305 was found within 23 of 29 specimens, totaling 6% average abundance (Fig. 3), and was 100% identical to Acinetobacter baylyi (GenBank accession # NR115042), and others found in the rhizosphere. Unidentified Enterobacteriaceae were also dominant in beetles found on native plants, representing 12% of the total recovered sequences. Of the 10 OTUs that comprised the Enterobacteriaceae within Cephaloleia beetles, a single OTU was responsible for 65% of the total Enterobacteriaceae diversity. This dominant Enterobacteriaceae OTU-79811 was present in >93% of beetle specimens, was 8% abundant on average (for all 29 beetles found on native plants; Fig. 3, shown in blue), and was 100% similar to Enterobacter/Klebsiella bacteria recovered from scarab beetles, sand flies, and pill bugs. Two additional OTUs (OTU127346 and OTU79806) each accounted for ∼15% of the remaining Enterobacteriaceae and were present in >15 of 29 specimens (Fig. 3). These OTUs were related to Citrobacter and Raoultella OTUs found in the microbiome of numerous insects, including honeybees (KR269812), scarab beetles (KT956239), and fruit flies (KX997073). Three additional OTUs were highly prevalent in Cephaloleia microbiomes (present in ∼64% of individual beetles), including a Lactococcus OTU-157643 representing an average abundance of ∼4% (Fig. 3), a Pseudomonas OTU-126400 with an average abundance of ∼2% (related to bacteria recovered from mosquitoes and sand flies; KY041526; Li et al., 2016), and a Comamonas OTU-104860, also with an average abundance of ∼2% (most closely related to bacteria found in association with fruit flies; KX994588; Fig. 3; Table S1). A large number of cultured isolates recovered from the digestive systems of Cephaloleia (81% of 37 isolated bacterial colonies) were members of the Moraxellaceae, Enterobacteriaceae, and Pseudomonadaceae, based on 16S rRNA gene sequencing. Several isolates had 16S rRNA sequences identical to the dominant bacteria identified via barcode 16S rRNA sequencing, including Acineto3 (=Acinetobacter OTU-28305), Entero4 (=Enterobacteriaceae OTU-127346), and Pseudo2 (=Pseudomonas OTU-126400). The Enterobacteriaceae were found to utilize plant-based compounds, including xylose and pectin (seven of nine isolates), mannitol (eight isolates), and lactose/glucose (all nine isolates). In contrast, none of the four Acinetobacter isolates in this study were able to digest these compounds, but instead uniquely displayed esterase C4, lipase C8, and lipase C14 capabilities (Fig. 4). Figure 4: Metabolic capabilities of bacteria isolated from the digestive system of Cephaloleia beetles. Metabolic capabilities of bacteria isolated from the digestive system of Cephaloleia beetles, including the ability to use lactose/glucose, pectin, xylose, and mannitol, as well as the presence of proteases, esterases, and lipases. White shading and the number “1” indicate the ability to digest the specified compound. Dark gray shading and the number “0” indicate an inability to digest the specified compound, “0.5” indicates a partial ability. At left, a phylogenetic tree, based on 767 bp 16S rRNA sequences, built with Tamura–Nei distance model and UPGMA method, of beetle digestive system isolates shown to the left. Scale bar, 0.1 divergence. Overall, the microbiome of specialist beetle species was significantly higher in diversity than generalists (2.6 ± 0.5 versus 1.9 ± 0.5, respectively; p = 0.0006, one-way ANOVA, Fig. 5). Measures of bacterial diversity (via the Shannon diversity index) were 0.8–2.5 for C. belti, 1.1–1.9 for C. reventazonica, 2.1–3.3 C. fenestrata, 2.0–3.0 for C. dorsalis, 2.4–2.9 for C. dilaticollis, and 1.5–3.0 for C. placida (Table 1). Further, NMDS ordination revealed the microbial assemblages of Cephaloleia to be strongly differentiated by diet breadth (i.e., generalist versus specialist; R = 0.74, p = 0.001, analysis of similarity (ANOSIM); Fig. 6A). SIMPER analysis implicated several bacterial families associated with this difference. For example, the Moraxellaceae, Enterobacteriaceae, and Pseudomonadaceae comprised a significantly higher percentage of the bacterial community in beetle species categorized as specialists (34%, 17%, and 6% of recovered sequences on average for specialist individuals, respectively) versus generalists (4%, 3%, 0.3%, respectively; all p < 0.0013, one-way ANOVA; Figs. 2 and 5). In contrast, results indicate that generalist Cephaloleia beetles were colonized by bacteria traditionally thought of as pathogens, including Rickettsia and Rickettsiella (discussed in more detail in supplemental information results). The Rickettsiaceae comprised a significantly higher percentage of the bacterial community in beetle species categorized as generalists, C. belti and C. reventazonica (28% of recovered sequences on average) versus specialists (only 0.8%; p < 0.0001, one-way ANOVA; Fig. 4; Table S1). For example, two Rickettsia OTUs (OTU7980 and OTU153335; Rickettsiaceae) were collectively present in only 11 out of 29 specimens, but comprised 11–26% abundance on average (for all 29 beetles found on native plants; Fig. 3). These OTU’s were 99% similar to Rickettsia found in leafhoppers (KR709154) and ticks (MF002591), to name a few. Similarly, a Spiroplasma OTU (Spiroplasmataceae) was present in 12 of 29 specimens, represented an average abundance of ∼12%, and was primarily observed in four individuals, two C. dorsalis and two C. belti (Figs. 2 and 3). This OTU57080 was 100% similar to the Spiroplasma associated with Drosophila. The incidence of Rickettsia and Spiroplasma was determined, via diagnostic PCR, to be highest in the smallest individuals of C. belti (81% prevalence, n = 8) versus the largest (56% prevalence, n = 8). Finally, a single OTU of Rickettsiella (Coxielliaceae) was only found in three C. belti individuals, but was highly abundant (∼31% on average; Fig. 3). This OTU43304 was 99% similar to Rickettsiella bacteria, also found in sand flies and ticks. Figure 5: Box plots of beetle-associated average diversity (Shannon index) and relative percent abundance of four key bacterial families. Box plots of beetle-associated average diversity (Shannon index) and relative percent abundance of four key bacterial families (identified by SIMPER to be responsible for up to 46% of the cumulative (dis)similarity among six Cephaloleia species examined in this study (n = 29 specimens, collected on native diets)). Any data points outside of the 25–75% range are identified by open symbols. Species abbreviations are as follows: plac = C. placida, dilat = C. dilaticollis, fen = C. fenestrata, dor = C. dorsalis, belti = C. belti, rev = C. reventazonica. Figure 6: Non-metric multidimensional scaling (NMDS) ordination of microbial communities associated with Cephaloleia beetles. Each point represents all 16S rRNA sequences recovered from a single specimen. Displayed data was square root transformed, which minimizes errors in the ordination due to PCR bias while also not sacrificing genuine differences between samples. Samples with similar microbial communities plot closer together. ANOSIM p values are shown. Lower stress values indicate better representation of the intersample (dis)similarities in two dimensions. (A) Ordination comparing four specialist species and two generalist species, the latter designated by triangles. p = 0.001, suggesting a distinct difference between the two feeding strategies. (B) Ordination showing the eggs of three species (outlined), compared to adults. p = 0.060 for all samples, suggesting a similarity to the communities found in specialist adults. p = 0.022 for the generalist species C. belti eggs versus adults, suggesting a significant difference between the two. (C) Ordination comparing three species, found on both native (filled symbols) and invasive plant species (open symbols). p = 0.001 for the two specialist species combined; p = 0.05 for C. belti, suggesting a significant difference in both cases. Similar to the adults, Cephaloleia eggs were examined for microbiome composition via 16S rRNA gene barcode sequencing (Table 1). 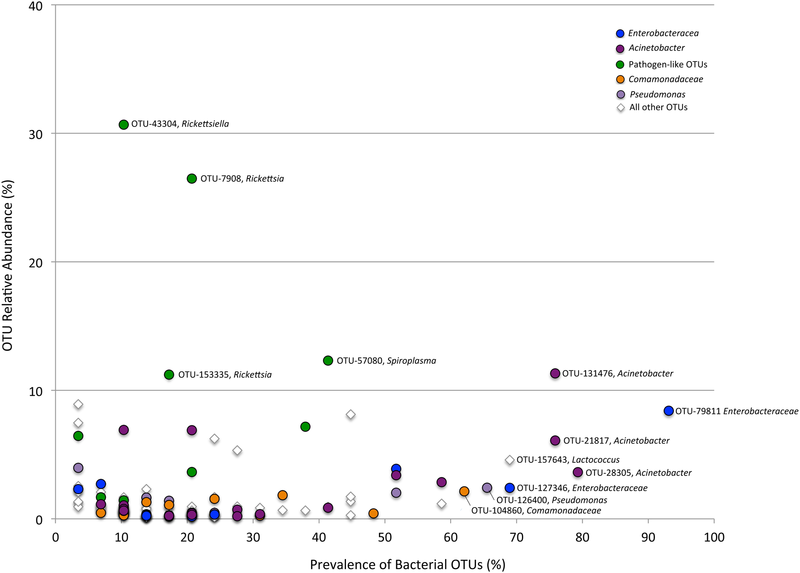 Four of the most common bacterial OTUs associated with adult beetles (Acinetobacter, Enterobacteriaceae, Comamonas, and Pseudomonas) were consistently observed in eggs (Fig. 7; Table 1), suggesting likely pseudovertical transmission from mother to offspring. 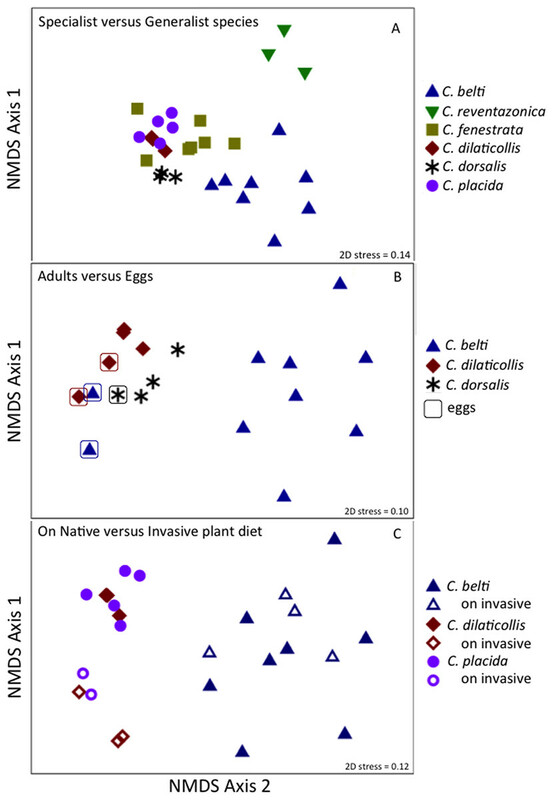 NMDS analysis revealed a general overlap of the microbial communities associated with eggs and adults (ANOSIM R = 0.19, p = 0.060; Fig. 6B). The egg-associated microbiome of the generalist C. belti was significantly different from the adults (ANOSIM R = 0.95, p = 0.022), based mainly on a near absence of Rickettsia in the eggs (only 0.01% abundance; Fig. 7; Table 1). Figure 7: Dominant bacterial 16S rRNA sequences, recovered from eggs and adults of Cephaloleia species. Relative abundance of the six most dominant bacterial genera, based on 16S rRNA sequences, recovered from eggs (left) and adults (right) of three Cephaloleia species. Species abbreviations are as follows (n egg, n adult, respectively): Cb = C. belti (2, 8), Cdil = C. dilaticollis (2, 3), Cdor = C. dorsalis (1, 3). Photo credits: S. Goffredi. The specialist Cephaloleia species collected on invasive plants exhibited an apparent dysbiosis in their microbiome. 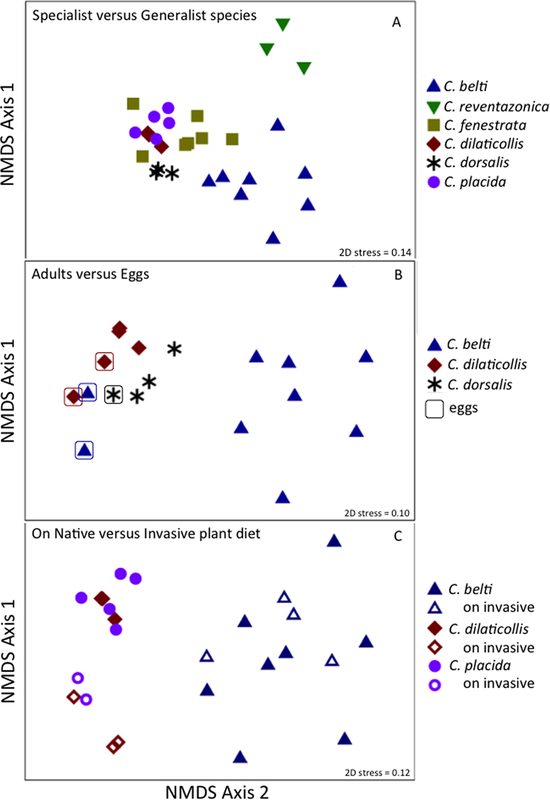 NMDS ordination revealed a distinct bacterial community structure between the specialist beetles collected from native plants, compared to those on invasive plants, including C. placida and C. dilaticollis both on white ginger (Hedychium coronarium; ANOSIM R = 0.97, p = 0.001; Fig. 6C). The specialist species found on invasive plants possessed a lower abundance of both Moraxellaceae (21% average 16S rRNA abundance when on invasive plants compared to 41% for native feeders; p = 0.0472, one-way ANOVA) and Enterobacteriaceae (6% average abundance in beetles feeding on invasive plants, as opposed to 18% for those feeding on native plants; p = 0.0357; Fig. 2; Table S1). This decrease in typical microbiome membership may relate directly to a concomitant increase in microbiome members such as Brevinemataceae, which was significantly more abundant in both specialist species on invasive plants (21% average abundance; a single OTU43892, ∼99% similar to Brevinema found in insect larvae and other invertebrates, represented 97% of all Spirochaete sequences), compared to those on native plants (2%; p = 0.012; Fig. 2). The four specimens of the generalist species C. belti collected on pink banana (Musa velutina) also showed a slight shift in microbiome (ANOSIM R = 0.27, p = 0.05; Fig. 6B; Table S1), with significant increases in Spiroplasmataceae and Enterobacteriaceae abundance (ANOVA p = 0.05 for both; Fig. 2). Virtually every living organism has an associated collection of bacteria and bacteria-sourced genes (i.e., microbiome), which account for more genetic and functional potential than even the host genome. Insects have emerged to be important for this research due to their variable nutritional strategies and ecological dominance. The speciose genus Cephaloleia has evolved in association with tropical ginger plants and, for many species at La Selva Biological Station in northeastern Costa Rica, their specific host plant associations are known. Several Cephaloleia species are also currently expanding their diets to include exotic invasive plants, yet it is not known whether their microbial community plays a role in this transition. For this reason, Costa Rican rolled-leaf beetles within the genus Cephaloleia present a unique opportunity to distinguish the effects of host diet from host taxonomy on the associated gut bacteria, as well as to explore whether movement of these specialized insects onto invasive host plants results in changes to the bacterial communities. The factors that affect insect gut bacterial communities are still not fully understood. In particular, diet has been shown to affect gut microbial communities in some insects (Colman, Toolson & Takacs-Vesbach, 2012) and conversely be a poor predictor of gut bacterial community composition in others (Jones, Sanchez & Fierer, 2013). In this study, we show that the core microbiome of six closely related Cephaloleia species primarily includes the Moraxellaceae, Enterobacteriaceae, and Pseudomonadaceae, and that diet breadth is significantly linked to microbiome diversity and community structure. Results suggest that the core recovered bacterial OTUs may be beneficial to Cephaloleia beetle hosts. For example, four of the most common bacterial OTUs associated with adult beetles were observed in eggs, suggesting likely pseudovertical transmission from mother to offspring. Sampling occurred over the course of 13 months, thus showing that these microbiome members likely have a non-transient relationship with their host. Additionally, Pseudomonas, Enterobacter, and Pantoea (also Enterobacteriaceae) have been found to play influential roles in development, nutrition, and success in other herbivorous beetles and true bugs (Bistolas et al., 2014; Wang et al., 2016; among others). A study by Minard et al. suggests that the mosquito Aedes albopictus specifically associates with Acinetobacter to help with digestion of plant nectar (Minard et al., 2013), while Acinetobacter and Pseudomonas in bark beetle digestive systems contribute to the nutritional requirements of the insect via the breakdown of plant-based compounds (Briones-Roblero et al., 2017; Ceja-Navarro et al., 2015). Representative isolates within the Enterobacteriaceae and Moraxellaceae revealed distinct in vitro metabolic capabilities with regard to the break down of plant-related compounds (e.g., xylose, mannitol, and pectin) versus lipids, respectively. Previously, Enterobacteriaceae were also found in Bombyx mori larvae (Lepidoptera) to similarly utilize mannitol and pectin, suggesting a role in the digestion of the mulberry leaf diet of the host (Anand et al., 2010). Some Chrysomelid beetles can degrade pectin and cellulose on their own, without the need of symbionts (Pauchet, Wilkinson & Chauhan, 2010; Busch et al., 2017), however, others lack this ability and, instead, possesses a highly specialized symbiont that degrades pectin (Salem et al., 2017). For the four species in this study, either situation may be possible. Additionally, many plants produce chemical toxins to defend against herbivory, and it is expected, although not well demonstrated, that bacterial symbionts could aid in detoxification of these defensive compounds (Ceja-Navarro et al., 2015). 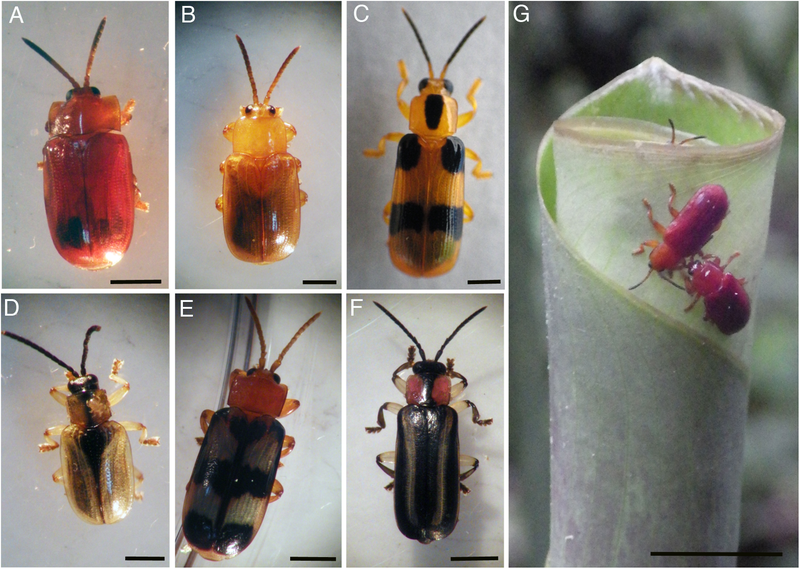 The primary food source of Cephaloleia beetles, the plant genus Heliconia, is known to produce polyphenolic compounds known as tannins (Gibbs, 1974). Interestingly, esterases in insects have also been shown to detoxify defensive plant compounds (Snyder et al., 1998), thus esterase-producing bacteria like Acinetobacter and Pseudomonas (Salem et al., 2017) could also provide this service to Cephaloleia. Preliminary experiments suggest that Acinetobacter isolates grow better in the presence of Calathea (Zingiberales) extract as the only source of nutrients (C. Blankenchip, 2017, unpublished). Tolerance to, and metabolism of, plant extracts hints at a possible role of either detoxification or direct nutrient acquisition by the dominant Cephaloleia microbiome, although further research with cultured bacterial isolates is necessary to examine this more fully. Cephaloleia beetles in this study exhibited contrasting dietary breadths; the two generalist species C. belti and C. reventazonica feed on nine to 15 plants from many Zingiberales families, while the four specialist species, including C. dilaticollis, C. dorsalis, C. fenestrata, and C. placida, each feed on only one to two plant species (McKenna & Farrell, 2005; García-Robledo et al., 2013). This comparison of six congeneric Cephaloleia species with varying diet breadth satisfies the recommendation of Jones, Sanchez & Fierer (2013) to essentially remove taxonomy as a factor confounding the influence of diet on the gut microbiome. 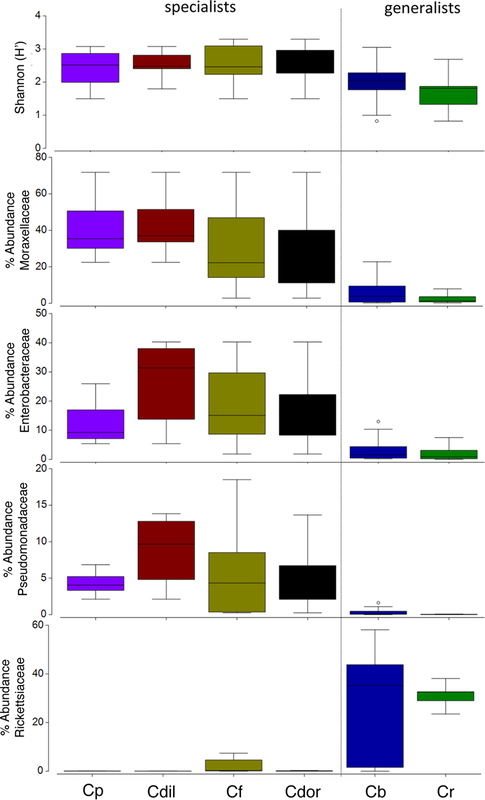 Overall, the microbiome of specialists was significantly higher in diversity than generalists, and was comparatively dominated by the Moraxellaceae, Enterobacteriaceae, and Pseudomonadaceae. The shift shown in Fig. 6A perhaps suggests that part of axis 1 could be due to intrinsic species differences (e.g., C. belti and C. reventazonica, the generalist species, appear separated), but that axis 2 is likely driven by diet breadth (all specialists cluster tightly together). It is worth noting here that C. dilaticollis encompasses two cryptic species, with opposing diet breadths, and that the individuals in this study possessed a microbiome community shared with other specialists. Thus, it was possible to infer the limited diet breath of this particular C. dilaticollis sub-species, based solely on a distinctive microbiome structure and diversity. The specialist sub-species of C. dilaticollis was subsequently confirmed via insect COI sequencing, in consultation with Dr. Carlos Garcia-Robledo (University of Connecticut). Generalist Cephaloleia beetles were, by contrast, colonized by bacteria traditionally thought of as pathogens, including Rickettsia and Rickettsiella, with a pattern of occurrence in these beetles (Fig. 3, shown in green) consistent with a pathogen-like relationship (Azad & Beard, 1998). They infect only a few individuals (and thus exhibit low prevalence), but when present, they achieve high numbers (and thus high abundance). Individuals that were colonized by these groups demonstrated a striking paucity of several of the most prevalent “core” microbiome members observed in all other beetles, including Acinetobacter and Enterobacteriaceae (Figs. 2 and 5). Sakurai et al. (2005) similarly showed that Rickettsia presence in aphids reduced the population of the beneficial bacterial symbiont Buchnera to 50–60% of its density in Rickettsia-free individuals. If these interloper microbial groups are detrimental, it would follow that beetles demonstrating dysbiosis would suffer fitness deficits, including weight loss and poor survival. Indirect observations support this assertion, in that the smallest C. belti individuals appeared to have a higher incidence of Rickettsia colonization (75%, as compared with 37% for the largest individuals, n = 8 in both groups). In other studies, Rickettsia has had a positive effect on insects, including higher fecundity, faster development, and fungal resistance (Sakurai et al., 2005; Himler et al., 2011; Łukasik et al., 2013). Whether beneficial or pathogenic, it will be interesting to further examine the possible antagonistic relationships among members of the Cephaloleia microbiome. Over the past several years, at least eight Cephaloleia species at La Selva Biological Station have been found foraging on invasive crêpe ginger, false bird-of-paradise, pink velvet banana, and white ginger (Schneider, Rasband & Eliceiri, 2012). In this study, specialist Cephaloleia species collected on invasive plants exhibited an apparent dysbiosis in the membership of both core groups, the Moraxellaceae and Enterobacteriaceae, and non-core groups Brevinemataceae and Spiroplasmataceae It is not known if these differences represent a change along a continuum as beetles adapt to exotic plants, or whether the changes in microbiome facilitate movement onto new plants, or neither. Determining whether an elastic microbial repertoire can be a form of direct, and rapid, environmental adaptation by the host is a next critical step given that the colonization of invasive plants is an inevitable new reality for all generalist and specialist herbivores. A 2013 NSF-sponsored report urged the scientific community to better understand phenotypic plasticity and sensitivity of animals to future changing environments (Padilla et al., 2014), yet none of the statements considered animal-associated microbiomes, or the immense potential of this metabolic reservoir for maintaining function in the face of changing ecosystems. The tremendous diversity of insect herbivores, particularly in tropical rainforests, is due in part to the relative specificity of their diets (Novotny et al., 2006; Forister et al., 2015). In this study, Costa Rican beetle species within the genus Cephaloleia, with known diet breadths ranging from generalist (foraging on over nine plants) to specialist (foraging on less than two plant species), were analyzed for their associated gut microbial community. The core microbiome of six closely related species of Costa Rican Cephaloleia beetles was limited and mainly included members of the Acinetobacter, Enterobacteriacea, Pseudomonas, Lactococcus, and Comamonas. Contrary to expectations, the microbiome diversity was significantly higher in specialist species, compared to generalists, and was dominated by these core groups (as were the eggs). Generalist beetles had lower diversity, primarily due to the exclusive dominance of bacteria thought to be pathogens, including the Rickettsiaceae. Bacteria isolated from Cephaloleia digestive systems had distinct capabilities in both digestion of plant-based compounds, including xylose, mannitol, and pectin, and possible detoxification of plant compounds via lipases. Additionally, changes in abundance of rare plants may significantly influence the balance between nutritional specificity and dietary breadth of herbivores (Norton & Didham, 2007), and in this study, Cephaloleia specimens collected from exotic invasive plants revealed a dysbiosis of the microbiome. In ecological terms, it may be possible in the future to use only microbiome patterns to know whether the beetles are surviving in native or exotic environments. Additional experiments are necessary to fully determine whether microbiome differences observed in this study are the product of intrinsic differences among species or result from shifts to novel plant diets, and what are the implications of replacement of native plants by exotic plants on the survival of beetles. The possible relationship between gut bacteria and niche adaptation, however, remains an important and urgent research question as organisms respond to future altered landscapes. Table S1. Select key OTUs identified by SIMPER, representing notable taxonomic groups associated with six Cephaloleia species (n = 29 adult specimens and 5 eggs)–OTU#’s and colors match those on Figure 2. All microbial relative abundance data was calculated from 16S rRNA barcode sequencing results. Heat scales are added for ease of visualization and are consistent among all columns. As is always the case in PCR-based analyses, relative abundance between taxa (i.e., comparing across a row) should be interpreted cautiously. A safer interpretation is the relative abundance of one taxon across multiple samples (i.e., comparing down a column). The full data set contains 274 OTUs, but these top 11 OTUs account for 48% of the total sequences recovered. Table S2. 16S rRNA barcode data for all samples in this study. 16S rRNA barcode data for all samples in this study, at the family level, with and without Wolbachia included. The authors thank Dr. Erin Brinton and Natalie Gonzalez for assisting in sample collection while in Costa Rica, Dr. Gretchen North for providing the intellectual support to identify plants, Dr. Carlos Garcia-Robledo for sharing his knowledge of Cephaloleia, the staff and administration of La Selva Biological Station, and the members of the Occidental College Microbial Symbiosis Laboratory. Chelsea L. Blankenchip conceived and designed the experiments, performed the experiments, analyzed the data, prepared figures and/or tables, authored or reviewed drafts of the paper, approved the final draft. Dana E. Michels performed the experiments, analyzed the data, approved the final draft, collected samples in Costa Rica. H. Elizabeth Braker conceived and designed the experiments, contributed reagents/materials/analysis tools, approved the final draft, contributed insect ecology expertise. Shana K. Goffredi conceived and designed the experiments, analyzed the data, contributed reagents/materials/analysis tools, prepared figures and/or tables, authored or reviewed drafts of the paper, approved the final draft. Field experiments were approved by the Costa Rican Ministry of the Environment and Energy. Permit #R-026-2015-OT-CONAGEBIO. 16S rRNA sequences for bacterial isolates are available from GenBank under accession numbers MF776885–MF776899. The raw barcode sequence data and QIIME processed data are available from the Dryad Digital Repository: doi:10.5061/dryad.5fj6t. Raw sequences were aligned and quality control for unidentified base pairs and chimeras was performed according to the specifics noted at https://sites.oxy.edu/sgoffredi/Symbiosis_Lab/LabScripts.html. Funding for this project is provided by the Fletcher Jones Science Scholars Award, the Occidental College Undergraduate Research Center Academic Student Project Grant, and the Occidental College International Programs Office. The funders had no role in study design, data collection and analysis, decision to publish, or preparation of the manuscript. Clarke KR, Warwick RM. 2001. Change in Marine Communities (Second Edition). Plymouth: PRIMER-E Ltd.